A White House task force on sexual assault at college campuses issued new guidelines Tuesday, asking colleges to survey students about their experiences. The task force was headed by Vice President Biden's office and the White House Council on Women and Girls, which is led by Tina Tchen. Noting that 1 in 5 women is sexually assaulted in college, the White House is releasing new guidelines to help victims of that violence and improve the way schools handle such cases. Campus sexual assaults are notoriously underreported, and schools' disciplinary processes vary widely. The suggestions in a new report released today by the White House Task Force to Protect Students from Sexual Assault provide colleges with basic guidelines for dealing with sexual assault cases; it also sets up a national reporting system that asks schools to survey their students about their experiences. 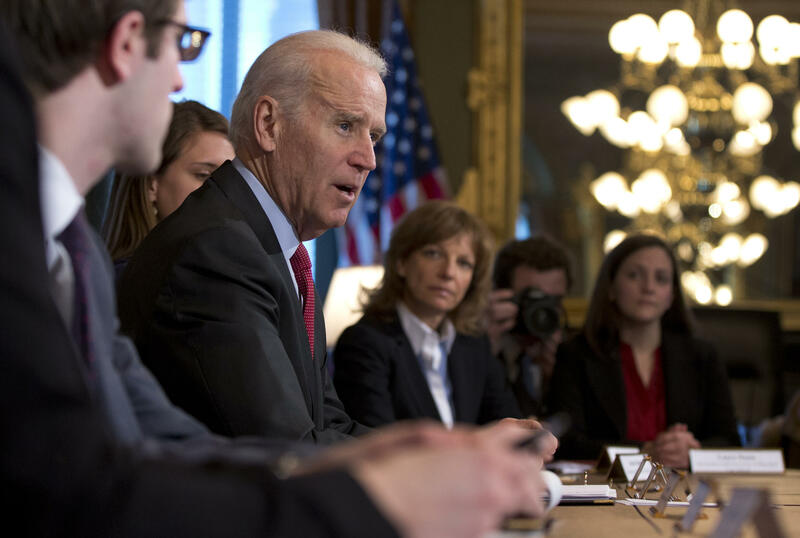 The recommendations stem from three months' work by the task force that was formed earlier this year, in response to widespread dissatisfaction with the way college campuses handle cases of sexual assault. A unique February conference on the issue hosted by the University of Virginia was filled to capacity by college presidents and others. "We know that too many universities are still discouraging survivors from filing complaints," said the Department of Education's Catherine Lhamon, who attended the session. "They are still delaying investigations for months, or longer. They are still retaliating against students for speaking out about their assaults." The new guidelines ask colleges to survey their students, to get a better picture of conditions on campuses. That system is voluntary, "but administration officials say the goal is to make it mandatory by 2016," NPR's Tamara Keith reports. As activist Laura Dunn tells Tamara, the current mandatory federal requirement only covers cases that are officially reported. "Unfortunately this has created a perverse incentive for campuses to keep that number low," Dunn says. "They are not discouraging the crime, they are only discouraging reporting, so by requiring a climate survey ... there will be a true picture of crime on campus." Dunn has spoken to NPR before — back in 2010, she told the story of her own experiences after being assaulted in 2004. Her story was part of an investigative series that found that when men at 130 U.S. schools were found responsible for sexual assault, only 10 to 25 percent of them were expelled. As Tamara reports on today's Morning Edition, Dunn's experience, which included an unsuccessful attempt to hold her attackers and her college accountable, prompted her to become an activist. She was consulted by the White House task force for its report. "It's very heartbreaking to know that there are still victims going through the same thing I went through," Dunn says, "a decade ago."